The sanctuary was part of Pugin’s original design for the church, but could not be afforded as part of the initial 1843 construction. It was eventually built in 1889, with the architect Frederick Walters faithfully following Pugin’s plans. The stained glass window was made as part of Pugin’s original design in 1843, dismantled in 1889 and replaced in the new east wall of the sanctuary. The maker was probably William Wailes of Newcastle, whom Pugin employed for the stained glass at St George’s Southwark around the same time. 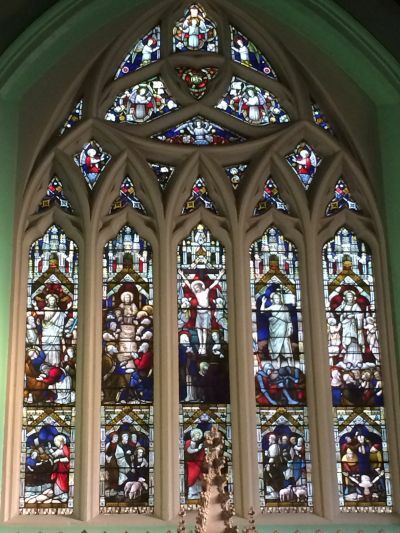 In the upper sections of the window are five scenes from the last days of Jesus on earth: Gethsemane, Last Supper, Crucifixion, Resurrection and Ascension.The subjects depicted in the lower part of the window all relate to St Peter. On the far left is the miraculous catch of fish after Jesus’ resurrection (John 21), which caused Peter to recognise Jesus and jump from the boat to meet him. The lower right panel shows the traditional version of the death of St Peter by inverted crucifixion.The three middle panels, partly hidden by the top of the reredos, combine as a single scene two Gospel stories. Surrounded by the other ten Apostles (after the suicide of Judas), Jesus is giving Peter keys (symbolising the keys of the Kingdom of Heaven - see Matthew 16)). The depiction of sheep and lambs relates to Jesus’ commands to Peter: “feed my lambs” and “feed my sheep” (John 21). 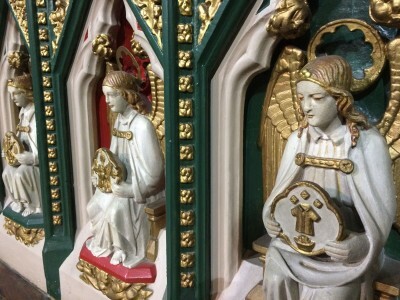 This stone carving behind the high altar was designed by Frederick Walter’s son, Edward, and made in 1943 in preparation for the planned centenary consecration of the church. The statues on the left and right represent St Peter and St Paul. Until the 1970s this was the altar used for celebrating Mass, with the priest facing away from the congregation and speaking in Latin. 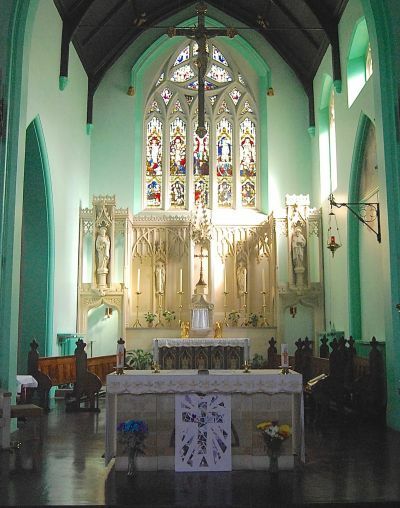 The altar front is believed to be the original Pugin design as it is very similar to others he is known to have designed around the same time. 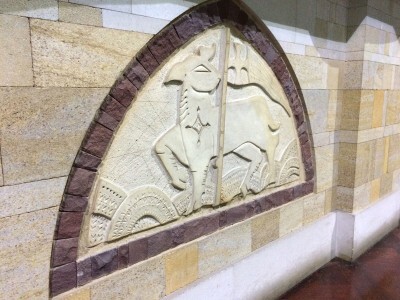 The main stone structure of the altar, however, was not installed until 1942/3, in preparation for the planned centenary consecration of the church. A forward altar was first installed in the early 1970s, after the Second Vatican Council had encouraged Mass in the local language with the priest facing the congregation. 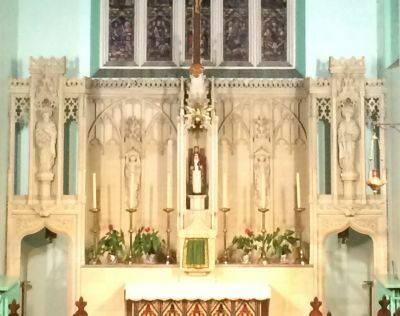 The present stone altar, with the matching ambo (reader’s lectern) was purchased in 1993, in preparation for the church’s 150th anniversary celebrations. The structure around the ambo is made from parts of the communion rails which used to separate the sanctuary from the rest of the church from 1892 until the 1970s. The Parish Magazine of September 1941 contained this item: “You may have noticed some Polish officers at the church services during the last few weeks. Perhaps you have heard one of them playing the organ during the 10.30 Mass. All of them had been through the horrors of the German invasion of their country. Their military course in Woolwich finished, they wish to commemorate their short stay and so have presented a fine brass Sanctuary Lamp to the church. The inscription is noteworthy To the certainty of Common Victory, And the Triumph of Right. From Polish Officers in Woolwich, June-August 1941”.